Andrea Swensen, CEO and Founder of HelloBeautifulLadies.com a website created for inspiring women for change. 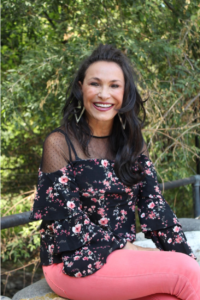 Helping women breakaway from their past and reinvent themselves, shares her story on her website. It’ a story knows that is both exhilarating and motivating She’s fresh, exuberant, funny and completely passionate about helping women feel and look their best, and about reforming all of the misguided trends that have kept in women in painful situations whether it be marriages, careers, bad habits, breaking free from abuse, finding their purpose and their passion, you name it. Andrea is a certified personal life and business coach. She is here to help. Andrea has been helping women for over 30 years. Here are the top 10 lessons that can be learned from Andrea’s Journey as an entrepreneur. 1) Fail Big – Edison said I didn’t fail when making the light bulb, I simply found 10,000 ways not to make a light bulb. Failure is not an outcome, but involves a lack of trying — not stretching yourself far enough out of your comfort zone and attempting to be more than you were the day before. Failing big is a good thing. 2) Visualize it – Visualize your goal and the outcome Be specific, concrete ways. 3) Don’t share your fragile idea with the world too soon. Keep your vision secret until you can patent it so that no one copies your idea. Only after I was 100% committed to my passion and purpose and my website and was ready to launch, did I share with friends to explain her new direction. Ideas are vulnerable, fragile things. Wait until you’re completely read to move forward before you share it with people. Meaning well, they’ll shoot it down, offering all the reasons why it won’t work. But when they do, you’ll be ready to deal with it. 5) Hire people you like and trust (even if they don’t know a great deal about what you need them to do). Andrea worked with a team of 8 whom she trusted had her vision and best interest in mind and who wanted to progress with her. Some had been friends and supporters from the beginning. 6) You don’t have to go in order. Andrea’s passionate commitment to her new idea was so fierce, she just tackled each task in the development and marketing journey as they came up, not necessarily in the best order for a smooth launch. 7) You CAN figure it out – you have the ability. Andrea knew nothing about social media, development, website development, online commerce, and more. But that didn’t stop her. She researched what she needed to, hired out what she couldn’t do, and marched forward with undying commitment and energy. Don’t stop yourself from pursuing an idea because you don’t think you have what it takes. 8) You can build a billion-dollar business starting with nothing. Andrea used her severance package from her previous employer, her life savings and took the biggest risk of her life. Working with purpose, passion and confidence she has made a way to make this work. You’ve heard the adage “do something you love and you will never work a day in your life” I agree. I have so much fun doing what I do and helping other that time passes by. I wake up in the night so enthused an invigorated about what I’m doing that it energizes me. For the new yoga wear line, Andrea embarked on designing a prototype, securing a manufacturer, naming the product, legally protecting her product, and getting the word out to potential buyers. You don’t have to be rich to move forward with your fabulous new idea. 9) Don’t worry about the outer “stuff” until the time is right. Andrea worked tirelessly from her home office creating her product, avoiding investing in outside office space or other marketing and business tools until the product had taken off. Anything that wasn’t essential to building the product and getting the name out there simply isn’t a priority. 10) Breaking the mold is a good thing. When Andrea began creating her yoga exercise wear line she had women ask to make large sizes because they wanted to wear the items as well. And simply couldn’t find stylish yoga and exercise wear in their plus sizes. Insights from a real woman wearing these items to shape the product development direction so the products were useful, effective, and as comfortable as possible. She broke the mold, and developed a completely new approach to developing women’s exercise wear complete with Cellulite slimming technology. In the end, Andrea’s story shows us what’s possible when we believe, when we’re resourceful beyond measure, and when our passion and commitment to something outside ourselves brings us to a calling. What are you most afraid of failing at? Will you get in the cage with your fears and take a step toward your dream today?